It’s a tourist cliché that features on the front cover of at least 50% of guidebooks and brochures for South East Asia – the Floating Market. But you know what? There’s good reason – floating markets are cool. There’s just something so wonderful about taking the retail experience to water. The floating market I went to was a half-day trip from Bangkok, and virtually anyone who deals with tourists can arrange a trip for you, with varying degrees of being ripped off. I teamed up with a pair of American marathon runners I’d met along the way, and we took the cab our hotel arranged for us – in retrospect, not the best move, as it turned out there were far cheaper options, but at least this was nice and simple. We boarded a narrow wooden boat with a noisy diesel engine and powered our way along narrow canals, peering with interest into leafy back yards. 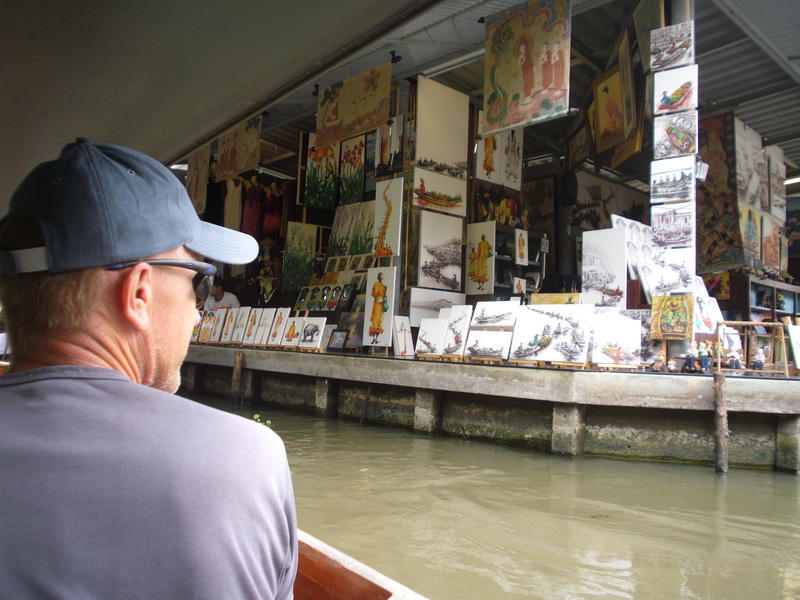 It took a good 20 minutes to reach the floating market, and there were plenty of other tourists around too. Our boatman quickly traded his accelerator for a paddle, and we were soon surrounded by things to buy. The shops were a mix of boats and land-based establishments overhanging the canal, selling a variety of tourist knick knacks and fresh produce. We bought some bananas and mango sticky rice, eating as we gazed at the sights. (Does it count as street food if you buy it from a canal rather than a street?) Like any touristy shopping area in Asia, it’s hard to just browse, and highly insistent sales people seem to think you must buy everything you do more than glance at. Admittedly the tacky souvenir stalls were cheesy, but in amongst it were some real genuine-feeling experiences. Women with cook stoves on their boats floated past amid clouds of delicious smells. Locals haggled over the price of fresh vegetables. The boats bumped against each other with almost comforting wooden thuds, splashing the dirty water against the edges of the canals. It’s a cliché, certainly, but it’s one I would definitely recommend.